Does Kalla’s species have something approximating the concept of a hug? Like how giraffes fight with their necks, but in this case, neck-hugs? I’m asking because Kalla seems like she needs a hug. I think, actually, everyone in this comic needs a hug. Yeah, but he uses his eyestalks to hug back. It’s like being embraced by a clacker. If there’s one thing I learned from reading the life stories in Humans of New York, it’s that probably everyone needs a hug. 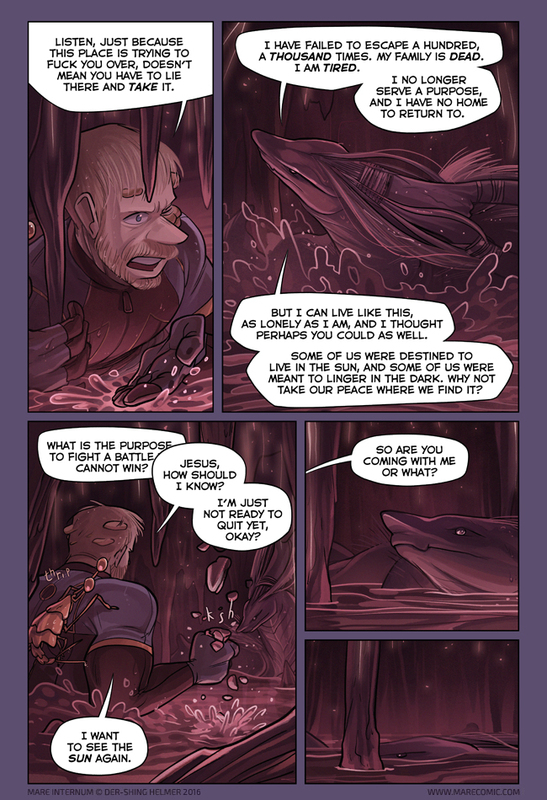 Armshark’s eyes look a bit different in this page. Not as large, or at least the pupil isn’t as large and void-like black as I’ve seen them. They look like tiny anime eyes. Oh, great idea XD I’ve been meaning to make that post for a while. Thrip is with you, Mike! The charming adventures of the Pot and the Kettle. And Thrip. Yes, there is much of this “seeing in other what he fails to see in himself”. Or maybe not. I think Mike may been a little (well more than a little) depressed and suicidal, and after his Martian underground adventures begun, completely under shock, overwhelmed by the events. But now knowing he’s in a really bad existential situation, on an alien prison of unknown purpose and after talking with a very, very old old prisoner (which can perfectly be the way himself would look in a few centuries, let alone millions of years), and watching what such despair really looks like, the fight or flee instinct is taking over everything. He will try to do it or die trying, and he’ll probably end up succeeding (these news of the aliens in martian underground just have to come out) and I don’t think Kallakore will stay put for long, even if facing the processors means his own death (another one). Because having Mike reach the outside may mean the end of his own torment, either by death or by simple change. That’s a great body plan for submerged sulking. It’s good to see he’s so determined. I guess he’s over the self-murder notion for now, poor guy. That’s what’s so awesome about this. He was all going to off himself and now he’s incensed at the idea of giving up. It would be cool if something like that would work with severe depression in real life (which is like saying it would be cool if magic worked in real life, I know–although I have heard of a few people who came out of pretty severe depression by similar means, so I guess it’s not complete fantasy). Yeah, this is definitely not meant to be a representation of all people suffering from a particular issue, haha. Still very much a story written by one person with a particular experience/ perspective. And, I’d argue that nothing has really changed about him from the first page as far as fighting for life goes. Mike values self-determination and control of one’s own fate. Before, he was completely at the mercy of his superiors and the possibly-malevolent social pressures of his community. He was alone, yet had to act like nothing is wrong due to being surrounded by his coworkers at all times. We are all trained from birth to be beholden the perceptions and expectations of other people. Mike, being withdrawn and unable to see past the (perceived?) ulterior motives of others, didn’t have the skills needed to change those expectations of him, and had no way to fight against his upbringing. Now, he’s in the dark. He’s unseen by others, and struggling entirely on his lonesome. He’s with Kallakore, but our armshark has no authority over him and is not someone whose opinion he needs to care about. While being isolated beneath the surface of Mars is a nightmare scenario for most people, such seclusion can be extremely liberating and give neglected virtues the breathing room they need to grow and become apparent. The processor, and the problems it causes, are also very immediate and very *physical*. Mike is both a pretty buff dude and a scientist with a highly analytical mind. This is his wheelhouse. Also, being underground is a new environment. I’ve heard that a nice change of pace can be just what’s needed to pull someone (even someone suffering from depression) out a funk. I’ve come out of circumstances where I felt I had absolute no control over my life and was ready to give up like Mike. Things changed. My perspective changed with it. It was unfortunate that it took the death of a sick family member that I had cared for YEARS for it to happen…but there it is. Such is life and I am much better now. Your explanation was very on the money. This is one of the best, most thoughtful posts I’ve seen in this comic’s comment thread. +1 adequately reflects that I have no further insights to add, but “+2” fails to reflect how awesome that insight and analysis really was. My only contribution is that, clearly, astronauts are simply too stubborn to die, and while he’s a bad astronaut, Mike is still an Astronaut™. brilliant! I like your reasoning. I kinda want to reread this to figure out when Mike switched from despair to hope. Fascinating. He seems to do best when he’s giving hope or inspiration to someone else. When he’s just living for himself, he doesn’t care. I fee like you nailed his character right there–but with the caveat that he can’t be leaned on desperately or he starts to crack from the additional pressure(beyond what he puts himself through). He just doesn’t see himself as lovable or likable or possibly even trustworthy, he’s too damaged. *Solely my opinions! Yeah, that’s a little too close for comfort. I love how -with the known backstory of Michael- deep it is. It is relatable in an encouraging way. What confuses me is that unless the leg-filter works in the outside atmosphere or he can find a way to communicate and then wait for a rescue, the reward for success is also death. For a couple of seconds, on that bottom panel, I thought he crushed Thrip and was about to be very upset. Stalactites are formed by gravity. Mars has much lower gravity than Earth. An Earthling should find it easy to snap the end off a Martian stalactite. Then, after forty hours of negotiation, they realize there’s literally no “Tab A” that fits into “Slot B”. Then she decides that display of passions is adequate payment, and the broken stalactite is adequate reminder of that display for the next million years. Suddenly, I wonder – what does Martian food taste like? Did Mike squish a once-in-a-lifetime opportunity? Does Martian food have drug-like effects on human biology? Are there nanomachines in that food that would have had brainhacking effects on him had he enjoyed the canapé? Would those brainhacking effects have included having his personality archived for the next billion or so years? So, let’s just call a spade a spade, here. When can I expect to fork over money to the Mare Internum book kickstarter? I’d love to have a physical copy of this story. Great. The first sentient life Humanity has come across. And he is just as depressed as the guy that found him. So, uh, hi. I just wanted to say that I love this comic and I love Meek and the art is just wonderful and I love space stuff, so I guess what I’m trying to say is keep up the good work. Thanks very much Anna :] Glad you’re enjoying everything so far!